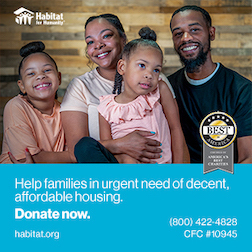 Habitat for Humanity builds or renovates housing in partnership with families to improve their health, education, financial stability and neighborhoods. We also aid communities devastated by disasters, with strategies for immediate and long-term shelter. Brandy Maistros protected and served her country before and after 9/11, then had new battles to face as a disabled veteran. Thanks to Habitat for Humanity's Veterans Build program, the Alliance, Ohio, resident finally is getting some of the appreciation and benefits she deserves. Like many other veterans, post-traumatic stress disorder limited Maistros' ability to work to support her two children, and the family slid into a spiral of poverty and despair. But a couple of simple acts of kindness changed everything. "This is my favorite story to tell everybody," Maistros said. Her son, Brandon, just 11 at the time, carried water to the thirsty Habitat volunteers working on a build in their neighborhood. That led to a conversation between Maistros and Bruce Cullen of Alliance Area Habitat for Humanity who urged her to apply for the program, but she hesitated. "Asking for help and then applying was the scariest part" of the Habitat homeownership process, Maistros said. "You're so worried that people are going to walk into your home and judge you. But they looked right past what was wrong with my home and just wanted to help. "Veterans, active-duty and reserve members of the military, police officers, firefighters and other Alliance Area Habitat volunteers worked beside Maistros to build a home her family right across the street from their old home. "Instantly, my whole life changed," Maistros said. "My life has done a complete 180, my kids are doing great. Everything is better all because of this Veterans Build." The family of Lance Cpl. Daniel McVicker, a local Marine who was killed in Iraq in 2005, raised a donated flagpole which stands in the Maistros' front yard.